I just wanted to share an inspirational story with all of you. And so far she has. Early 2010, Wilson participated in the Ohio Crossfit Sectional, where she came in 7th place out of 55 competing women. She moved on to the Crossfit Central East Regional competition where she placed 18th. So what is the appeal of Crossfit vs. traditional gym workouts? And why should women do it? Most Crossfit workouts (or Workouts Of the Day – WODs) are designed for speed. You perform movements and lifts for a certain number of sets. The quicker you do them, the quicker you are done. Because Crossfit utilizes Olympic-style weight-lifting, with the right form, women can lift heavy weight they never thought they could move. However, some women are afraid to lift heavy because they fear getting bulky muscles. Price also mentioned there is no such thing as “toning or firming,” contrary to the heavily marketed fitness apparel and equipment. Price sees women at his gym start Crossfit to simply lose weight. However, after a month or two, things change. Crossfitter Maria Paxos agrees. As a woman she feels powerful doing the Olympic-style weight-lifting. Crossfit women also participate in the advanced moves of Crossfit such as pull-ups, ring dips, handstand push-ups and more. 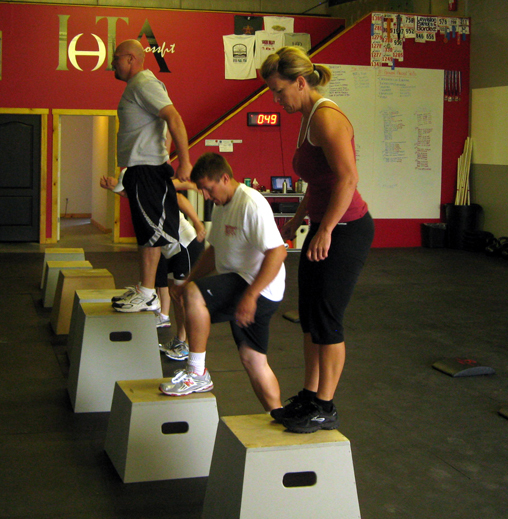 Scaling a WOD means adjusting the prescribed weight or move to accommodate your skill level and strength. For instance, instead of a handstand push-up, a female could elevate her feet on a stack of weights or do push-ups on the floor. Pull-ups could be done with band assistance or with rings instead. These tweaks often provide the stepping stone females need to feel not only successful in their workout, but also grow their strength to eventually perform the prescribed weight or move. In addition, men often out-number women in the Crossfit gym. At Crossfit Utility, the women are trained and encouraged the same as any man. Many women agree – Crossfit provides them the best workout of their life. Price encourages interested women to call the owner or trainer at a Crossfit affiliate and ask if they can call a couple of their female clients. Coach Brett sets a new 1 Rep Max Overhead Squat PR @ 205#! Get comfortable with it. If you’re not failing, you’re not getting better. And if you’re not getting better, you’re getting worse. This idea represents two important things to me. First, intensity is everything. A properly balanced program will vary its workouts in terms of style, movement pattern, and volume, but not in intensity. Whether the focus is strength, endurance, or metabolic conditioning; whether you’re working deadlifts, overhead presses, or sprints; whether its Angie or Fran; the intensity has to be maximum. This is not to say that every workout must put you on the floor. Intensity isn’t necessarily about exhaustion. It’s about focus, will, and the commitment to a full effort, regardless of the challenge. For example, my grandmother is training to lose weight through a combination of cardiovascular training, group strength classes, and Pilates. Needless to say, her ideal post-workout position is not sprawled on the floor next to a trash can. Her approach to fitness should, however, mirror that level of physical intensity in her concentration and dedication to completing her routine with maximum effort. This attitude will force her to test her limits on hikes, with weights, and on the Pilates mat, ultimately pushing her to the point of failure in many respects. This is a good thing. The same can be said for Crossfitters, just in a more obvious way. 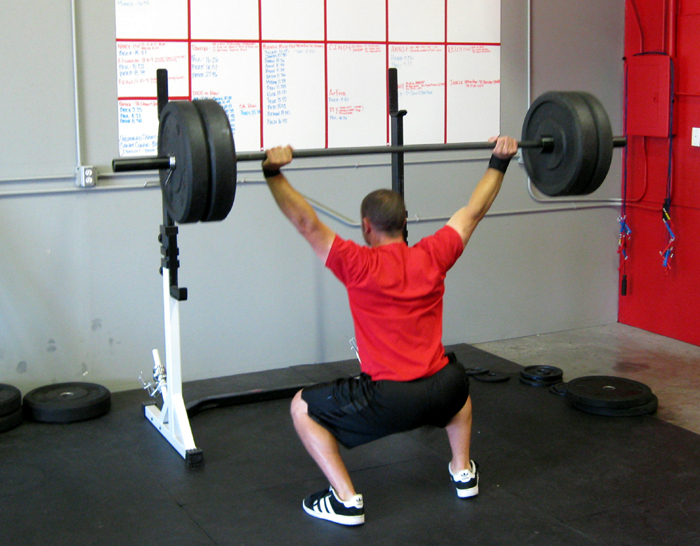 WODs are designed to test limits in a wide range of physical and mental capacities. So test them! The people who get the most out of workouts are not the ones who complete them easily, or those who zone out halfway through in an effort to “just get through it.” If you ever find this to be the case during a workout, you’re missing the point. One inarguable beauty of this program is that, regardless of ability, every WOD can be met with the same level of effort and focus, and thus can impart the same physical and mental effects. The biggest beneficiaries are the people who fail over and over and over during the course of a WOD, and then get up to fail some more. The second concept failure brings to mind is fear. People are so afraid to fail. From a young age, it is something we have been taught to avoid at all costs. This fact, combined with the knowledge that failure is actually essential to our ultimate success, makes this fear one of the toughest paradoxes for our psyche to overcome. I, for one, know this emotion too well. Before football games I would get this deep, paralyzing self-doubt regarding my own ability. Every week, I was certain the defensive back opposite me was stronger than I was, faster than I was, and, in general, better than I was. This usually didn’t subside until the first major collision of the game, when the intensity level became so high that I no longer had time to doubt myself, only to act. Interestingly, I see the same thing happen all the time in gyms and Crossfit boxes. As Sarah wrote the chipper on the board at the Butcher’s Lab this past weekend, different people softly objected to elements they were weak on, or complained that they would have to scale. In Halmstad for the Scandinavian Challenge, I heard stories of people dropping their names from the competition when the WODs got posted, mostly because they were inconsistent with their personal strengths. Every time someone is embarrassed to bench press or back squat next to a guy that can double his total, it’s the embarrassment over his relative failure that holds him back. How to conquer this fear? Rather than focusing on the competition between individuals, focus on the competition with the workout. Again, this should be the competitive standard for all workouts anyway. Then, when you really need it, when you’re just about to quit, when you’ve been pressed to the brink of failure, that’s when you start looking for extra motivation. That’s when you use the intensity of those around you to will yourself to the next rep. That’s when the community leans on itself, pushes its collective limits, and builds itself stronger than before. The bottom line is that fitness requires failure. Your body adapts to challenges it cannot meet in order to better prepare itself for the future. This process involves levels of fear and intensity that are typically uncomfortable, but absolutely necessary. If you’re not outside your comfort zone, you will not improve. And if you’re not trying to improve, what exactly are you doing? Fist and foremost HAPPY BIRTHDAY (on Aug 2nd) to our own Jen Pitcher. Isn’t being 21 GREAT 😉 !! 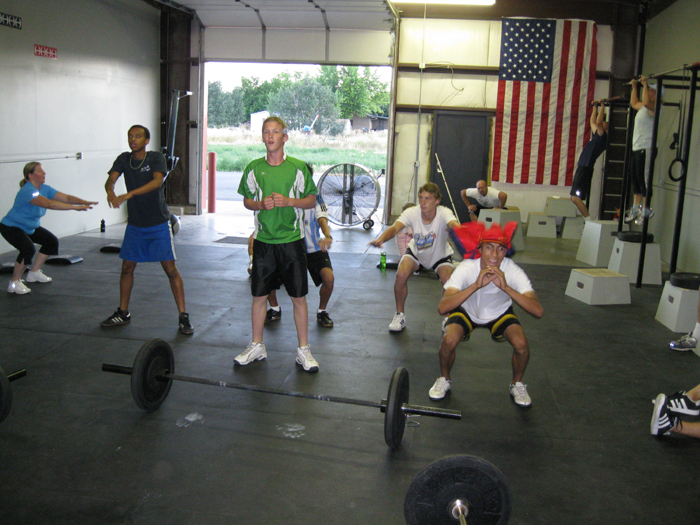 These are some of the guys from the Logan High Soccer team before the WOD! Here are a few of them post WOD - What a difference 8 minuets can make! 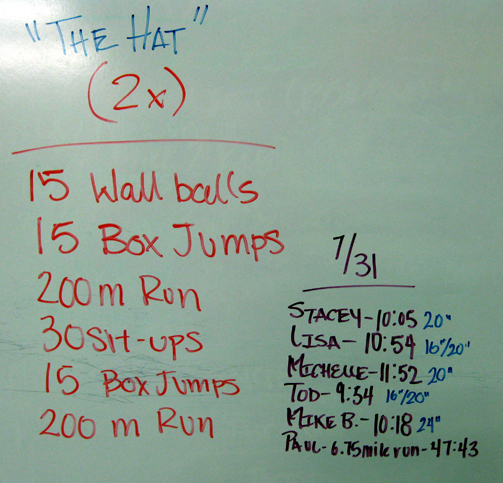 With August come something new and permanent at CrossFit IoTA….another white board!! It’s not the whiteboard that’s important, it’s what’s going on the white board! This new board will contain your/our names, goal(s), the date they are achieved and a third column that we will fill each month with the goals and PR’s (Personal Records) that are achieved by the members of CrossFit IoTA during that month. SETTING A GOAL – A goal is a specifically desired end state, expressed in a positive tense, which provides motivation and direction on the path to achievement. Why are we putting them on a white board? When you write your gaol on the board it strengthens the relationship between yourself, the coaches and fellow athletes and provides a bond of trust and accountability. You are putting more of your trust in our community of members and coaches to help you remain accountable to your goal. The goal must be concise and specific. “I want to complete 21 consecutive kipping pull-up” (This is one of our newest members Stacey Baker goal). Having a clearly defined goal such as this, will allow both the athlete and coach to know what we are working towards together. This also allows both the athlete and coach to evaluate training practices, progress and achievement. The goal must be expressed in a positive tense. The conscious and subconscious brain will either promote or inhibit athletic performance. In other words, reality lives in conversation. If I tell myself “I’ll never be able to do double unders” well then there’s a good chance you won’t. But if you tell yourself “I’m going to get one double under, and keep practicing until I do, then before you know it, not only will you have one, but then two and three! Use positive affirmation towards the end of achieving your goals. Don’t tell yourself “I can’t” or “I won’t ever be ale to do that”, tell yourself, “I’ll try” or “I’ll keep practicing until i get better and can do that”. This positive self talk will creat an indomitable spirit as you realize what your mind can believe and your body achieve. A goal must be realistic and achievable in a realistic time frame. A goal must provide a certain amount of challenge and motivation, but avoid making it so difficult or so far away that you don’t reap the benefits of achievement. Use self assessment as a tool. If you’re goal is to run a mile in under 6 minuets, the first thing to ask your self is what is your current mike time? If you can’t answer that, then let’s get that established so we can look at a proper timeline for achievement. Many contend that the grey matter between your ears is the most important “muscle” in your body. A properly prepped mind can lead to victory, while a mind filled with negativity can destroy an athlete with self-doubt. Start thinking about what your goals are. They can be anything from committing to coming to the box a certain number of days a week during a month, to performing a lift properly at a certain weight, loosing weight, running faster, completing a race, the list could go on and on. Talk with the coaches if you need ideas, or lets us know what your goals are so we can get them written on the whiteboard. And now a few words from Coach Tami 🙂 I freakin’ love CrossFit and everything it stands for. I can’t wait to help our clients set goals as well as some for myself. I have to say I worked on positive self talk with my wall balls, sounds ridiculous, but it has worked. I don’t think I am the fastest by any means, but I don’t loath them as much and I know I can do them. It works to make positive statements out loud and to yourself. I know I am my own worst enemy most of the time. I have loved watching everyone’s confidence just sky-rocket from when they first joined. I can really see their changes and it is awesome! CrossFit mental toughness translates to real world problems. Today was a proud day for all of us. The energy of the 6am class was electric and it carried throughout the day. Here are a few great things that I saw. 1st – COMMUNITY – A member that has been with us for less than 3 weeks, took someone who was at CFI for her second time under her wing during the warm-up and helped her though the movements. Thank you Brandi. I’ve seen this from a lot of our members. We all go through the same thing everyday with the workouts and having someone there to help and just be your friend is what we are all about as a community. 2nd – TEAM WORK – As the 6am class was finishing the WOD all eyes turned to one of our members who was doing pull-ups for the first time in a WOD. There where encouraging words and a shouts of support as Tod Martin pounded through is last few pull-ups. A cheer and high fives were given as he finished off his last few reps. Team work and comradery was what I observed, no one left behind, all cheering for each other to do their best and finish the way they started. Well done Tod, Mike N, Lane and Tyler H who all did pull-ups in a WOD for the first time today!! 3rd – CROSSFIT WORKS – Today’s workout gave us all empirical data that CrossFit works! You can get fit doing constantly varied, functional movement done at a high intensity. Quite simply short, intense workouts done with proper form and function can give results. If you don’t believe it, look at what we did today. Everyone PR’d (read Personal Record, ie bested) their rookie time. After two months everyone got faster, stronger, better and some of you even have pull-ups! Our most improved athlete, Jen Pitcher. The first time Jen did the “Rookie” WOD she completed it in 14:21. Today she completed it in 5:40 and did a second round in 12:48. That’s two time through the same movements in less time than it took her to do one round less than 2 months ago. How cool is that!! That’s all I’m giving you 😉 You need to come and see what you pull from the HAT! – UPDATE: We had a great time thismorning. Lisa got to draw the number of rounds and everyone else got to draw out a movement. YOu can see what came out of “the hat” below! A new study has found that both viewing television and playing video games are linked with increased attention problems in youths. The research found that children who exceeded the two hours per day of screen time were 1.5 to 2 times more likely to be above average in attention problems. Among elementary and middle-school populations, girls play for an average of about 5.5 hours/week and boys average 13 hours/week. Playing games is not limited to adolescent boys. Recently, the Wall Street Journal reported that several companies are now designing video game consoles for preschoolers. Preschoolers aged two to five play an average of 28 minutes/day. The amount of time spent playing video games is increasing, but not at the expense of television viewing which has remained stable at about 24 hours/week. Simply put, the amount of time spent playing video games has a negative correlation with academic performance. Know the rating of the video games your child plays. Monitor all of your child’s media consumption — video games, television, movies and Internet. Supervise your child’s Internet use — there are now many “video games” available for playing online. Take the time to discuss with your children the games they are playing or other media they are watching. Ask your children how they feel about what they observe in these video games, television programs or movies. This is an opportunity to share your feelings and grow closer with your child. Share with other parents information about certain games or ideas for helping each other in parenting.